As I am trying to type this, my mind is completely lost in all the memories of this great man. Not in a mood to write anything, but there is something which I thought is worth sharing with all of you - a perfect tribute to The Wall from Harsha Bhogle. Rahul Dravid batted exactly like the person he is: stately and upright, dignity and poise his two shoulders, standing up to everything coming at him with minimum fuss. He picked his shots carefully, almost like he was weighing the risk for fear of letting himself and his side down. There was little about him that was flamboyant - there isn't with an oak - and patiently, brick by brick, he built giant edifices. He is a good man and he batted like a good man. And like with most of his choices in life, he has chosen well again. He has not craved a full house on its feet, there has been no grandstanding. The retirement is a sports-page event not a gossip item. He knew it was time. "I'm sure you have thought it through," I said when he called. "I know this is the time," he said. "Any longer and it will be for the wrong reason." I expected nothing less from a man it has been my privilege to watch and to know for 16 years. It was but a feather that prevented him from getting a century on debut at Lord's. He would have liked it, for he has this sense of history about him. He would have wanted to be on that honours board, and 15 years later he inscribed his name there with a Dravid special. They love him there like he is one of their own, and indeed England has been a recurring motif in his life. The 1999 World Cup; the majesty of 2002, when he outbatted the world and produced one of his finest innings in Leeds; winning a series as captain in 2007; and then those three centuries last year that reminded us once again what Test cricket was all about. At Lord's he remained not out from No. 3; at Trent Bridge he opened the batting and was ninth out; and at The Oval, at the age of 38, he had but ten minutes between deliveries as he batted through the innings for six and a half hours, before returning to open the batting. A standing ovation had just died down before another took its place. I stood too, not for the first time. And he loved to explore England, on foot, in buses and in trains; always asking about the latest musical and offering extended reviews of those he had seen. One such exploration took him to Scotland, from where he returned humbler, if that was indeed possible. He was getting paid to play, he said, but everyone else was paying to play - taking unpaid leave, shutting down shops, all for the sheer joy of playing. He learnt, he said, how much you can take for granted as an international star. I can see why he will continue to be a giver, why his doors will be open for other cricketers. And I hope they learn from him never to say no. There were two things Dravid didn't really love in cricket: opening the batting and keeping wicket. He was asked to do both at various times, and I asked him if he ever contemplated saying no. He didn't enjoy it, he said, but took it as a challenge, to see how good he could be. This acceptance of challenges is what has defined his cricket and made him one of the finest team players there has been. A challenge, he said, allowed him to understand himself better, it gave him a reason to play sport. If he shied away, he would never know how good he could be. He kept wicket in about 70 one-day internationals, never most convincingly, but he allowed himself to look bad for the team to look good. It was always the team for him and in the little piece he wrote for the book that my wife Anita and I did, he quoted Kipling: for the strength of the wolf is the pack and the strength of the pack is the wolf. It was nice to see a cricketer quoting from literature. The team is like a pot, Dravid often says. Some put in and some take out. The more who put in, the fuller it gets, and those were the players he enjoyed playing with the most: those who put into the pot. He was one of the leading contributors and there was never an effort at gaining sympathy or media attention for it. He gave quietly. He was one of the reasons why India recovered so quickly from the match-fixing issue around the turn of the century. India had some outstanding men of integrity at the time. Tendulkar, Dravid, Kumble, Ganguly, Laxman and Srinath. It was a good group to belong to. 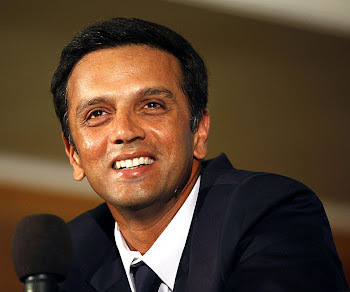 The turn of the century was also the coming of age of Dravid as an international cricketer. He had proved people wrong about his ability to play one-day cricket at the World Cup but then went to Australia convinced he needed to do well there to gain respect. It is a word he will often use in conversation ("the respect in your dressing room and that of your opponents is what matters") but in quest of it that time, he tried too hard, cocooning himself into a mass of nervous energy. He struggled but returned in 2003, at the height of his powers as a batsman, to peel off a double-century in Adelaide that won India a famous Test. He scored many in that phase, most of them away and throughout his career, his home and away averages have sat close together. It is the mark of a genuinely great player. And it is away that the most memorable innings were played: in New Zealand in 1999, England in 2002, Australia and Pakistan in 2003-04, and in the West Indies in 2006. To that extent he was the true successor to Sunil Gavaskar. And his father will be proud of that. Oh, we family folk are suckers for that kind of sentiment. In 1994, when I used to do the highlights of domestic cricket for ESPN, Dravid's father would often call to ask if he could get highlights of his son's batting. The request was always very politely made and a thank you was always offered when I met him. You can see the shyness in the genes, the correctness. I don't mention it lightly. In our obsession with saluting the here and now we sometimes ignore what produced success. If Dravid senior was proud of his young man, Rahul was proud enough of his mother to be the photographer when she received her PhD. It might seem a small thing to do but it tells you a lot about the person. Giant edifices are built on solid foundations. And so it is with a touch of emotion that I will say goodbye to India's finest No. 3. He wasn't the Wall, not for me. Yes, his defence was as perfect as it could get, his steeliness so admirable, but he played shots that warmed the heart. The cover drive, with the big stride forward, and the prettiest of them all - the whip through midwicket played so late and while so nimble on his toes. He will be missed, as the great always are. He will see his children grow, take them to school, imbibe in them the reading habit (for he read more than most people I know and couldn't understand why others didn't), but from time to time he must tell the new flowers that will inevitably bloom in our cricket of the need to put grit over beauty, team over self, challenge before rejection, humility before arrogance, for that is what he stood for. Well played, my friend. You have the honour of leaving the game richer with your legacy and none of us can ask for anything more than that. Salute to u Mr gentalman . U will never retire in our heart . The wall always stands tall . Rahul Dravid has been the best batsmen i have seen play in international cricket. i understand now after he started playing t20 that had he desired he could have played test cricket with lot of unwanted aggression. But the true cricketer he is, he has always played with a sense of purpose, with an intent and strategy to achieve the teams motive. u warmed our hearts as a batsmen and u continue to stand tall in the commentry box. i salute u dear rahul and wish you all the best in your life. thanks for all those moments of pure charismatic brilliance you have created on the field. Earlier The Laws of cricket said thay players shall be GENTLEMEN but as time progressedthis character ruined. Match fixing , ball tampering incidents are enough to convince us on this issue. But as history repeats a new gentleman came from Karnataka as sweet as jam as steady as wall to lift the spirits of the game from the ruins and has made the world see INDIAN CRICKET as high as never before. He is a calm tsunami who after his retirement has left a deep imprint on our heart.